The Beaphar Canishield Flea & Tick Collar for Dogs is great for keeping fleas, ticks and sandflies at bay. Great for dogs travelling abroad and is suitable for dogs from 7 weeks of age. Beaphar Canishield Flea & Tick Collar for Dogs contains the insecticide deltamethrin, which is slowly released from the poly matrix of the collar. 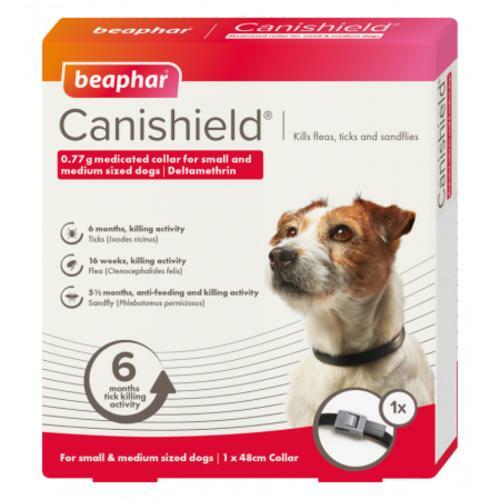 Beaphar Canishield Flea & Tick Collar for Dogs kills fleas for up to sixteen weeks, ticks for up to six months and sandflies for up to five and half months. For best results, use early in the season before fleas are seen, and at least one week before your dog is likely to be exposed to ticks. Great for dogs travelling abroad at risk of leishmaniasis, which is transmitted by sandflies. Beaphar Canishield Flea & Tick Collar for Dogs is suitable for dogs from 7 weeks of age.